I just bought a few Revere skillets from a garage sale and the big one has a black coating on the bottom of the pan that is peeling off. Should I try and get all of the black coating off or is there a way to keep it from peeling? What should I do? Thank you for your help! That definitely appears to be a newer style pan (post 1968, and from what I see happening to the bottom, probably much newer). It appears to me that there is a layer of burnt carbon over the copper on the bottom. 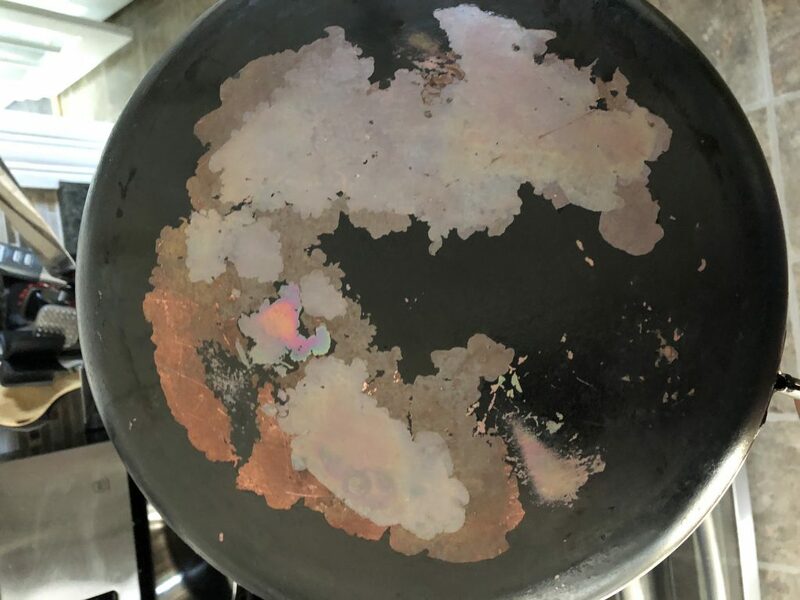 The copper layer appears to be peeling off of the stainless core of the pan. they made the layers of both small. Since that time, the quality has gotten really bad. Some of the years they appear to have made the copper layer so thin that it just exists to make the pan look like the old style, but the copper layer wasn’t thick enough to actually do anything (like spread the heat). This appears to be one of those pans. It is not uncommon for the copper layer to peel off for pans made like that, meaning, we’ve heard lots of stories of this happening.